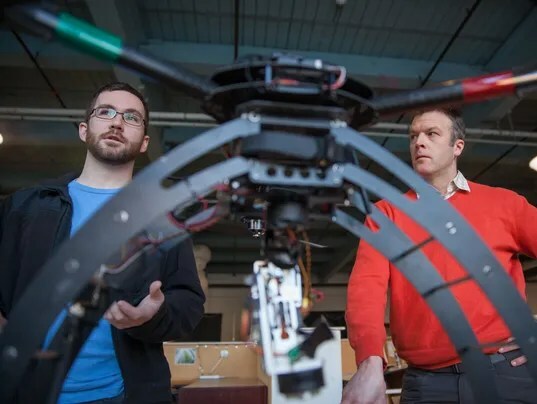 Burlington startup AirShark, which builds airborne drones, is tethered to a very short leash. Its co-founders and sole employees Jon Budreski and Ian Ray are professionals. They customize the little rigs to tote all manner of cameras, sensors and mapping gear. At a work station at Burlington Generator (the maker-space beneath Memorial Auditorium), the two are developing a new, all-weather craft. This looks like a really cool business, and it’ll be interesting to see where they go. Read the entire article here. You can visit their website here. This entry was tagged Drones. Bookmark the permalink.